Located in the north-eastern outskirts of Rome, San Basilio is an area often associated with criminality. Here the Sanba Project, whose aim is to redesign the neighbourhood starting from the imagination of its own inhabitants, colour-washed the grey-ghetto atmosphere by inviting several street artists to undertake their own artistic projects involving the local community. The first street artist to arrive was Liqen, who painted two murals about the (nowadays unbalanced) relationship between men and Nature: “El Renacer”, where rebirth is seen as the result of a general rake sweeping up all the scraps of the industrial economy, and “El Devenir”, in which Mother Nature has gained back its supremacy, represented by an idyllic scenario made of plants and insects. Still in 2014, Sanba hosted Agostino Iacurci, who painted two murals representing the relationship between the neighbourhood and its inhabitants. In “The blind wall”, a man is watering the plants and thus taking care of its neighbourhood, while in “The globe” San Basilio is depicted as a globe held in great esteem by its inhabitants. 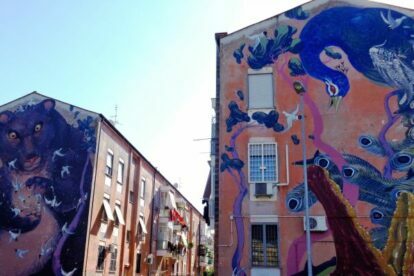 But my favourite intervention was made one year later, and it covered six different facades overlooking Giulietto Minna Park: a work by the street artist Hitnes. Hitnes’ work is highly surrealist, almost dreamlike, and depicts six different animals as if they were the guardians of the neighbourhood.